As already in previous years, the base for the team's activities was the joint stand organized by the "German Yachts" boat and ship building association. 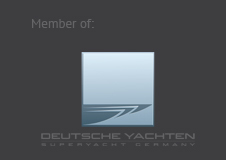 The excellent supervision of the stand by Claus-Ehlert Meyer and his team makes this the ideal place for meetings with customers and talks within the framework of the German Yachts network. As already in 2013, Wolz Nautic – the teak deck specialist based in the district of Würzburg – took on the role of main sponsor of the BOOTE EXCLUSIV Party held on the open air terrace of the Hotel Miramar directly overlooking the harbour. This party is one the highlights of the Monaco Yacht Show outside of the official exhibition programme. This was already the second time that Wolz Nautic has sponsored the event, and the company is planning to continue its involvement next year as well. Given the extensive reach and coverage of and by BOOTE EXCLUSIV – a magazine covering the luxury yacht sector – and the exclusivity of the event itself, the invitations are highly coveted and sought after by designers, shipyards, owner representatives, suppliers and a host of other branch insiders and are, from experience, quickly snapped up. We are very much looking forward to the 2015 party and getting together with all of the guests again.